Vodafone vs Virgin Mobile | Which one is best? Vodafone vs Virgin Mobile – Which One is Best? Vodafone vs Virgin Mobile : We compare the two to see which is right for you. 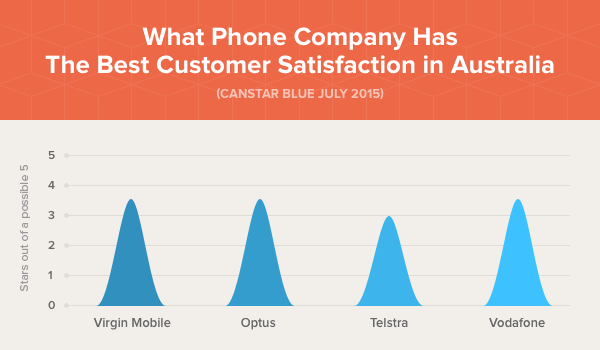 Vodafone Australia and Virgin Mobile are the nation’s number 3 and number 4 phone companies respectively. Each is a vibrant brand focused on the young and young at heart. Both offer special discounts for those who buy online and more included value than Telstra. Virgin generally have better data inclusions in their plans at each price point than Vodafone. Virgin also use the Optus 3G and 4G network, generally considered to be better than Vodafone’s own. Finally, Virgin ‘throw in’ a bunch of additional plan features like free Virgin to Virgin calls and free Voicemail pick up. With some of the best customer service in the industry, picking Virgin is actually a no brainer. Overall, we recommend Virgin Mobile. Choose Virgin Mobile and you’ll get an experienced phone company, a brand that more people love, better pricing and a great network. As everyone knows, Vodafone have endured a number of network problems. They’ve recovered a great deal from their lowest ebb in 2010. These days, either Vodafone or Virgin Mobile, will give you great network coverage, including 4G speeds. Additionally, get a SIM Only plan with either of these two and you stand a good chance of getting better value and better customer service than you will get from the bigger tier 1 phone companies ( Optus and Telstra). Overall, we recommend Virgin Mobile. Choose Virgin Mobile and you’ll get an experienced phone company, a brand that more people love, better pricing and a great network. (Virgin use the Optus 4G network) They include ‘extras’ in their plans that Vodafone doesn’t dream of – we cover these Virgin Value and Virgin Perk elements in detail, below so you can see why we have come to the conclusions we have. This article relates to postpaid SIM Only plans. We have other articles which might help you in your search for the right plan. If you prefer prepaid plans, check out our Virgin Mobile prepaid review. We have a separate SIM Only review for Virgin Mobile if you’d like more detail on this element of their plans. Obviously, Vodafone have their own prepaid offering, too, in addition to the SIM Only plans shown on this page. We have a dedicated page too for Vodafone’s postpaid ( SIM Only ) plans. SVOD or Streaming Video On Demand is a feature which is becoming particularly important in phone plans. Optus and Telstra are placing big bets on entertainment as part of their plans and SVOD is a good way to provide that. Similar to SVOD, streaming audio is part of both Virgin Mobile’s and Vodafone’s current plan range. We explain the critical differences between those plans. Additional plan inclusions like streamed audio make it even harder than it was to decide the answer to this critical question – how much data do I need ? Getting a plan on Virgin Mobile gives you pricing which is as keen as Vodafone Australia and access to the Optus 3G and 4G network. You may have noticed friends complaining less and less about the Vodafone Australia network as time goes on. Vodafone have spent a fortune on improving their infrastructure and they’ve spent it wisely. In June of 2013, Vodafone turned on 4G network services and, again, dealt with it responsibly. They have encouraged customers to upgrade to the 4G network at the same time as they have suggested purchasing an additional data bolt on for customers that needed it (typically, those with a high end phone on a low end plan.) There is no more soul crushing experience than getting a huge bill for your phone usage. Vodafone know that and have learned their lesson. They’re proactively helping customers avoid it. Since then, they’ve spent $billions and make no mistake, Vodafone network coverage has improved a great deal. Virgin Mobile use the Optus 4G network, however. They don’t use an element of it. They don’t use most of it. Virgin Mobile have access to every last section of the Optus network. Since Virgin’s pricing is closer to Vodafone’s than Optus, you can get the best of both worlds. Getting a plan on Virgin Mobile gives you pricing which is as keen as Vodafone Australia and access to the Optus 3G and 4G network. Like all phone companies, there is an overlap between Vodafone and Virgin when it comes to the way their approach their postpaid SIM Only plans. Whichever you go with – Vodafone or Virgin – these are the features you’ll get. Optus pioneered this now commonplace phone plan feature and it’s changed the industry. Whether you choose Virgin Mobile or Vodafone, you’ll never get a huge bill for blowing your data allocation. Once you use up your allocated monthly entitlement, your phone company will add an extra GB to your allowance and charge you $10 for it. Both Virgin Mobile and Vodafone are mature phone companies with big customer bases. They know what they’re up to. The self service apps and online self service tools that each phone company provide you are great these days. Vodafone Australia is part of Vodafone Group. They operate in around 70 countries around the globe and have around 500 million customers to their name. Here are the plan features you can expect to get if you pick a SIM Only plan from one of the biggest phone companies in the world. Vodafone are so confidant in the quality of their network (and cognizant of the need to reassure people about it before they’ll buy ) that they’ve launched the Vodafone Network Guarantee. Buy the phone (or the SIM), sign up to the plan and, if the network doesn’t work where you need it to, they will accept a return within 30 days. You’ll have to pay for what you use and, of course and there are some other (quite reasonable) terms and conditions to bear in mind. Vodafone’s global reach means they can effectively partner overseas and have used the facility to offer a $5 a day max roaming to UK, US and NZ and an ever expanding range of international destinations. It’s hard to overstate the size of Vodafone Globally. The company operates in 70 countries. In most of those, it is the number one phone company by size and, believe it or not, thought of in the same network quality terms as Telstra is over here. Vodafone announced in mid 2013 that they would offer a $5 international roaming bundle for travelers. That means you’ll pay a maximum of $5 for every day you spend overseas in the UK, US or NZ, to call home to Australia. Since then they’ve added new territories to the locations in which they offer this plan feature. They’re up to 50 countries and counting! On high end, 24 month plans, Vodafone will offer you a selection (that is, you get to pick what you want) of content to use on your phone. Users can pick from a subscription (covered by Vodafone) to the Sydney Morning Herald, a subscription to Spotify or a subscription to Stan. These agreements were negotiated a while ago and the landscape has changed a great deal since they were put in place. The critical thing to understand is that, with Vodafone, the data you use for the use of Stan, Spotify or the Sydney Morning Herald comes out of your plan. That could be a big deal. Streamed video services like Stan can use a GB per hour of data. If you watched a TV show from Stan on your phone on the way to and back from work, you could blow even the biggest data allowance Vodafone have (currently 15 GB.) Optus and Telstra have remodeled this approach and now offer plans in which the customer is not charged for the data they use streaming selected services. The same is true of Virgin’s streamed audio offer, which we cover below. Virgin Mobile is completely owned by Optus. They occupy the same offices, move staff between their departments, share the same canteen and, importantly, are one of the many phone companies which resell the Optus 4G network. Virgin’s postpaid SIM Only plan range comes with free streamed audio. If you access your Spotify, IHeartRadio or Google Music account from your phone, you can listen all day ( at up to 512 bps ) and you won’t be charged. Contrast this with the content Vodafone offers above. Uniquely, Virgin provides their SIM only (postpaid) customers a facility to rollover their data inclusion (or their leftover voice / SMS) to the next month if it’s not entirely finished during the month they’re in. We think you need to be managing your data so well that there is none left over in the first place. But it would be a strange person indeed which said rollover is of no use. At WhatPhone, we have friends who have worked with agencies, employed on the Virgin Mobile account. It might be surprising to know that the average Virgin Mobile Australia customer is aged in their early forties ! The brand stands for a lot. It’s fun, genuine, helpful and they offer great deals. Virgin Value is the name given to the additional plan features that existing Virgin customers and those consider joining, are given as rewards. In fact, when you actually consider them, these plan features are the sort of things that all the telcos should offer. But they don’t. So they count in Virgin’s favor. If you pick up one voicemail a day, free voicemail will save you $30 a month out of your cap fees. That’s a significant amount, more than 10% of the low end caps. All calls, at any time of day, from one Virgin Mobile customer to another, are free. If you and your partner are both on the Virgin network once a day for a standard 2 minute call, you will save yourself nearly $150 a month! If you don’t use your credit during the course of a month (this applies to SMS, voice and data) it is rolled over in to the next month so you can use it then. Unfortunately, it’ll only last for that month so you can’t stockpile and run up significant unused allowances but this feels a lot fairer, doesn’t it! Weirdly, given Vodafone’s huge global reach, Virgin Mobile Australia offer better call rates on their international plans than Vodafone do. Virgin’s International Calls (to selected destinations) are included in their caps. 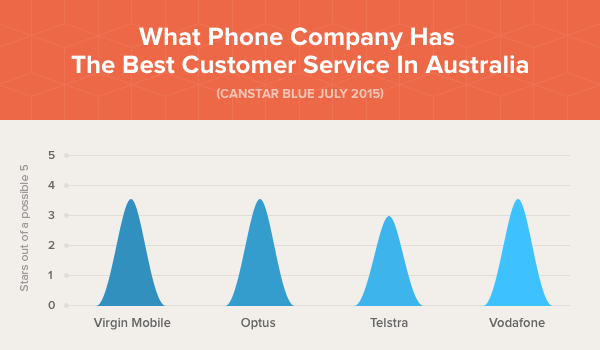 Virgin have the best Customer Service and Customer Care in Australia (compared to the other top 3 phone companies.) They regularly come out on top in independent benchmarks. The only telco which does it better is Amaysim. Vodafone vs Virgin Mobile – Customer Service comparison. Virgin’s price plan inclusions are the best in market, particularly on data. Even better than Vodafone’s typically. Virgin Mobile have partnered with other Australian Virgin Brands to offer sweet family deals. You’ll get preferential treatment when applying for a Virgin Credit Card, you’ll save 10% on Virgin flights and even get better value insurance. Summing up – Vodafone or Virgin Mobile ? Virgin’s data inclusions, network and plan ‘extras’ (Virgin Value and Virgin perks’) mean that this comparison has a winner which is clearer than usual – Virgin. Almost every factor leans in their favors. The only exception is for those who travel overseas a lot – in which case the $5 per day extra roaming service they have may be worth your while. To this, we add in the new frontier of telco phone service offerings, content / entertainment bundles. Vodafone’s outdated practice of charging customers for the data they use when they access their Stan or SMH account could use the entire data allocation in every one of Vodafone’s plans.